Powerful, Interactive Visualizations Turn Your Team into Data Scientists – No PhD Required. 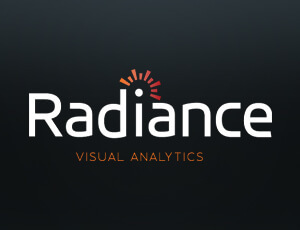 Radiance transforms millions of data points into quickly recognized and understood fact patterns. Fast and flexible, these visual analytics help users find relevant information quickly across date ranges and geographies, inside social networks and communication patterns and within projects and teams. 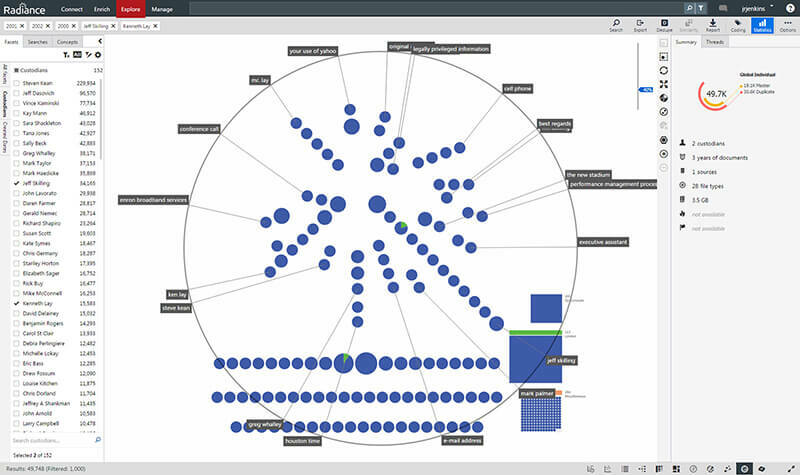 Easy to use, accessible at any phase of a project and highly interactive, the Radiance visualization library works with both metadata and content to surround your document ecosystem with compelling entry points for analysis and investigation. 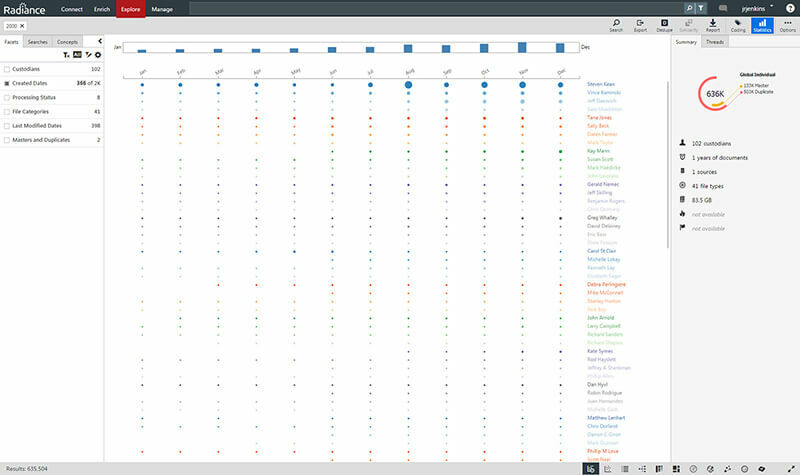 Fully integrated into the Radiance Document Explorer, the library can quickly visualize search results, filtered lists or your entire document ecosystem. 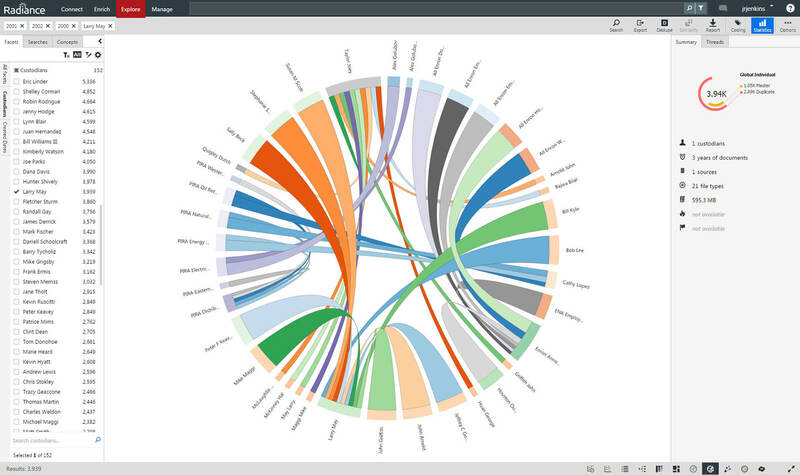 And no matter the type of investigation or analysis project, one of our more than ten visualizations will help you see your data in a new light. 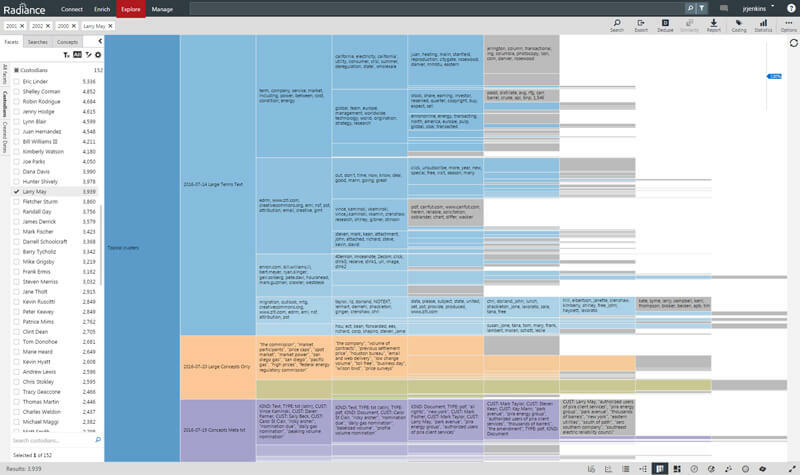 The unofficial “home page” for Radiance, the Chronology visualization displays how documents are distributed over a period of time, based either on custodians or document coding (tags, issues, or pick lists). Users can select any “dot” to see those documents or select years, months or day to drill down to an even more granular visualization. 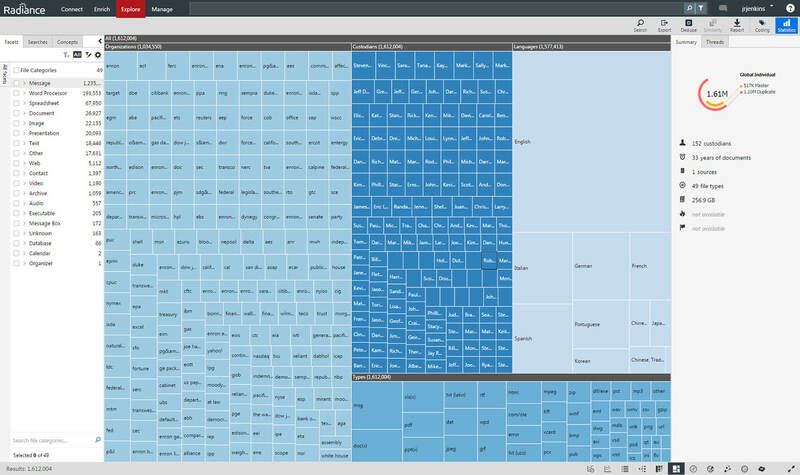 The Data Plot visualization provides the same X/Y visualization methodology found in the Chronology visualization, but allows the user to customize the fields using organizations, languages, custodians, or tags. Highly interactive and engaging, the Data Plot is a great place to start an investigation. 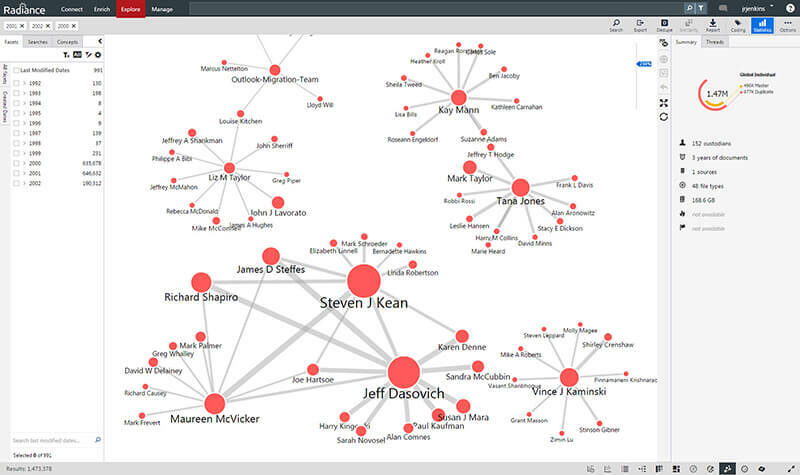 The Social Network visualization provides a graphical representation of e-mail exchanges between senders and recipients. Unique names can be selected, social networks quickly identified, and communication patterns assessed. Document Mapper displays documents in unique clusters, based on conceptual similarity. Users can quickly review groups of documents which share terms and concepts – expediting analysis and improving understanding of key issues found in the documents. Partition provides a high level overview of all the concepts found in the data set. 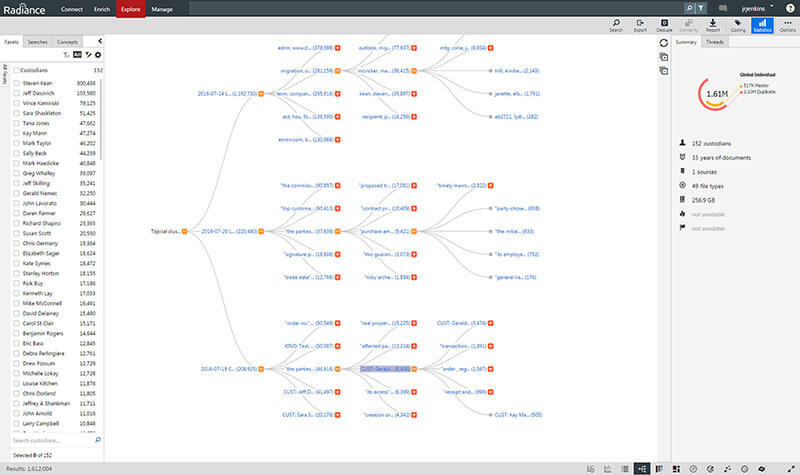 Perfect for starting an investigation, this intuitive visualization allows users to move left to right inside a set of documents and focus on unique clusters which share similar concepts and metadata. Interesting clusters can be tagged and set aside for closer review at a later time or reviewed in real time using list view. The Relationship visualization provides a graphic representation of e-mail communication. With a simple hover of the mouse Radiance will display the number of e-mails sent to and from specified recipients. 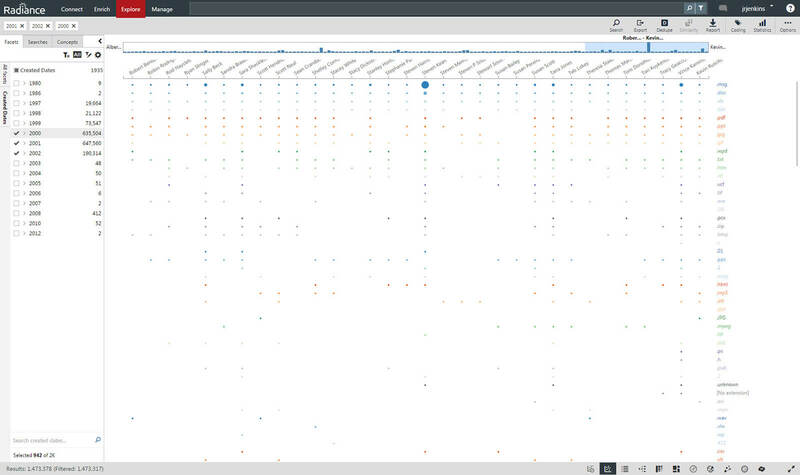 And as with all visualizations in Radiance, you can view the specific e-mail exchanges with just a click of the mouse. 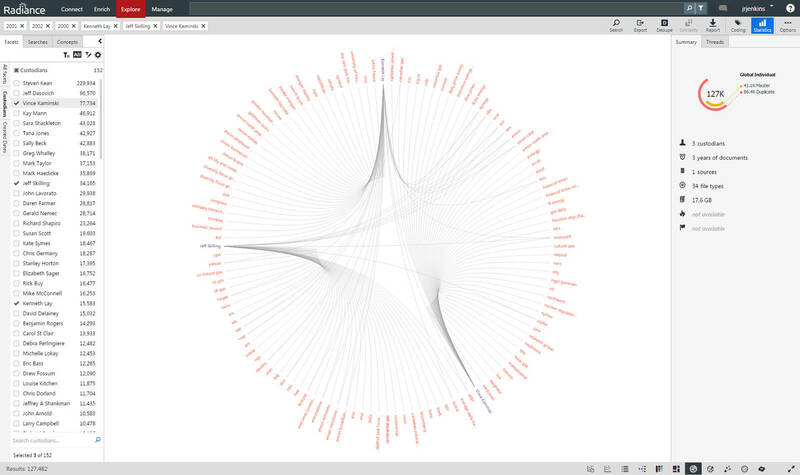 The Bundle visualization displays the relationships between custodians and organizations. The relationships are color-coded to make it easier to identify specific connections. Invaluable for determining the scope of an investigation, the Bundle visualization can help you make sure you are seeing the complete picture. 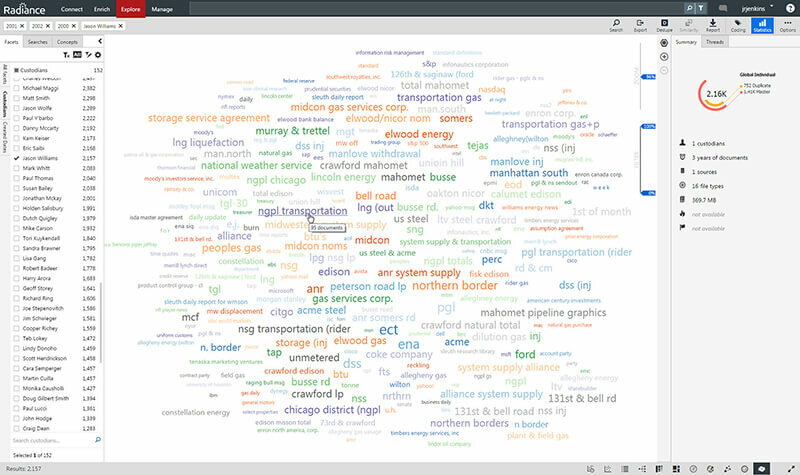 The Radiance Word Cloud displays words and phrases based on the number of documents in which they appear in the current data set. The greater the number of documents associated with a term, the larger and bolder the type. Users can fine tune the cloud by excluding terms to render a more accurate map based on the merits of the investigation. The Collapsible Tree visualization displays issues or topical clusters in a hierarchical tree, allowing for easy review and exploration if you are new to the investigation. Users can expand or minimize issue or topical cluster branches, or view the documents associated with each issue or topical cluster. The Treemap visualization displays all facets found in Radiance, grouped by category. The size of each facet is proportional to the number of associated documents giving teams working on ECA a clear picture of the details associated with the document set.